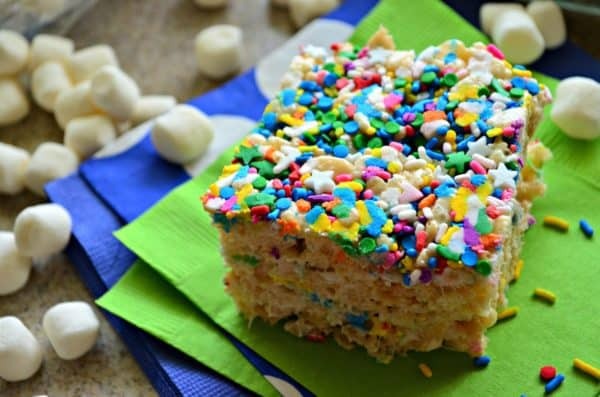 Treat your family and friends to Cake Batter Rice Krispie Treats. Perfect for any occasion and you can make them in 15 minutes or less! I haven’t posted a rice krispie treats recipe in quite some time. These rice cereal treats are something that I love to make and crave to eat often. One of my good friends from my “mommy group” had a birthday recently. Since we were meeting for our Letter of the Week group on her actual Birthday I knew I wanted to treat her and the kiddos to something sweet. But I also didn’t want our kids hyped up on lots of sweets. 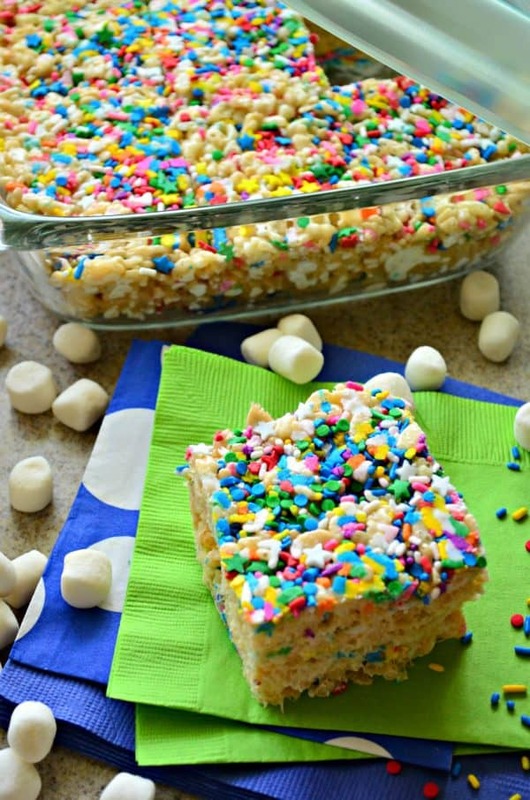 I started brainstorming a bunch of ideas and that’s when I decided to make these Cake Batter Rice Krispie Treats. I always have butter, Rice Krispie cereal, and mini marshmallows on hand. And on occasion I have boxed cake mix on hand– so when I was looking for a quick dessert to make I knew I wanted to experiment with making a cake batter version of the rice krispie treats! Of course, I thought I had a large container of sprinkles, but after pulling apart my pantry I didn’t find said large container of sprinkles. But I did; however, have two smaller containers of sprinkles–you know the round sprinkle shakers with the wide variety of sprinkles in them? So I literally just started shaking a little bit of each type of sprinkle giving me the ultimate birthday party like treats! I like to use an 8×8 pan where others like the 9 x 11 pan. I like to have a thick cut rice krispie treat not a thin one. If you use the 8×8 pan you’ll get 9 large treats or 18 mini treats. Whatever your heart desires. I like to use the OXO Bake, Serve, Store glassware because it comes with a lid. Keeping your food fresher longer! 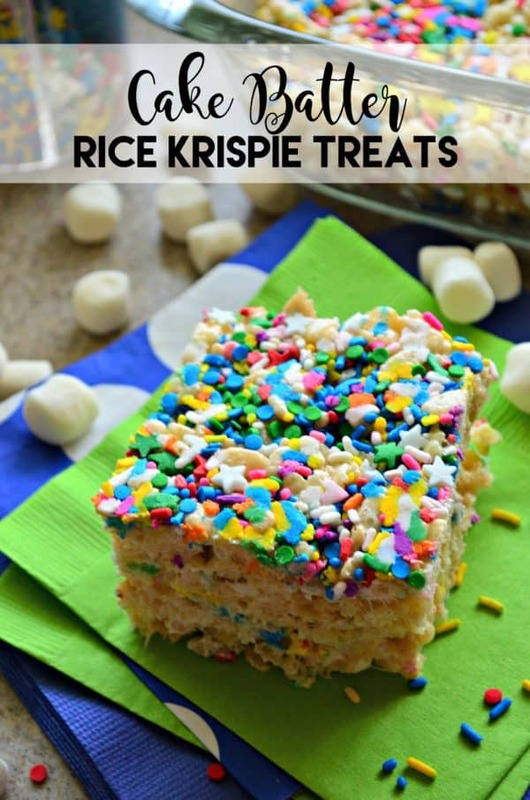 So if you have a special occasion that you need to make a dessert for or maybe your just craving a sweet treat–make my Cake Batter Rice Krispie Treats! Melt butter on medium heat. Once butter i smelted add in the dry cake batter mix and the mini marshmallows. Mix well and remove from the heat. Pour in the rice krispy cereal, mix half way then pour in half the sprinkles. Mix quickly so that the sprinkles don't bleed. Pour into an 8x8 glass pan sprinkle with remaining sprinkles. Take a piece of parchment paper and press down until even and flat. Set to the side for 30 minutes, then cut into squares and enjoy.